The standard USB B connector supplies 5 VDC power to the MCB9B500 board. The USB B connector is used when the board is configured as a USB Device. 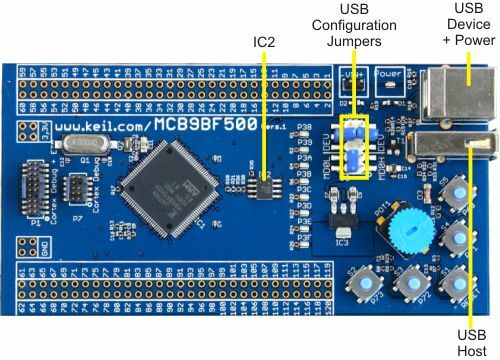 The USB A connector is used when the board is configured as a USB Host. See the Jumper Description chapter for more information about configuring for USB Device and Host modes. The MCB9B500 board USB A connector is supplied with an LM3526-L power switch/over-current protector (IC2) for USB hosting applications.